Here you can find links to information about transport within the region - the trains, local ferries, fast boats, bus routes and the road system. 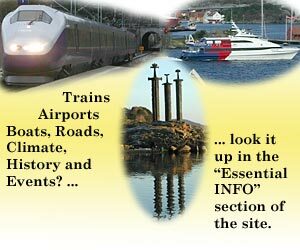 If you want to find out about ways to arrive in south west Norway from outside the region - by air or ferry - then see the arrival page. You may need to hire a car on arrival in Norway - especially now that there are no ferry services to England or Scotland. There are many ferry and fast boat services in the area - car ferries and various types of fast boat for foot passengers. Rail services run close to the coast from Stavanger down to Kristiansand and then up to Oslo. There is also a route through the mountains from Bergen across to Oslo - including the famous Flåm railway branch line. There is a good network of bus and coach services. The buses serve the towns and surrounding areas, with longer-distance coaches running between the towns, along the coast and inland.